Local Private Tour Guide | Phuket, Thailand | Ruetai S.
Hello, my name is Ruetai but you can call me Pai . I am a new local generation with travel experienced more than 10 years. I love to travel and have a service mind in the travel business. 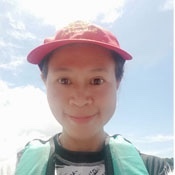 Being a tour guide in Phuket Island is my career that I would like to offer my services to all visitors and tourists and welcome them to Phuket Island. Let me make you know that Phuket doesn't have only beaches and islands. It still has a lot of interesting places to visit including our cultures and also many local foods. I love Phuket because it makes me happy every days and there is always something going on. And I love travelling and try to find on discover a new interesting places, activities in Phuket Island. Because I have found that there are some feedbacks from tourists that are not too impressed with Phuket this makes me to decide to make my program tours to show the travelers about the local people, culture, food, excursions, sightseeing that the travelers can explore on this beautiful island. All of my tours can make you fun and learn our cultures, food, histories and stories. Because of all of places and foods has their own story. And I can personalize this tour 100% for you. Let me know your special request. Pick me as your personal tour guide. I can make you enjoy with our real life and food. Our tour guide was Pia and we had a wonderful day together. She was knowledgeable and very attentive to our needs. Pia was a terrific guide. She was on time and easy to find at the Phuket port. The vehicle was comfortable and air conditioned. Our driver was excellent and got us to our stops on time safely. My husband has some mobility issues and Pia was there to help with the stairs and uneven surfaces. I would recommend her highly. I am not a driver but I can arrange for a car or van and driver for your private group.